Goldfinger is a James Bond movie that goes back to 1964 (that's right I am a James Bond fan). However, we are going to talk today about Goldfinger(s). Golfingers is a term that I created for the group of people who are convinced in using Gold as a medium-term investment. Since the dawn of time Gold has been considered a safe haven that earned its value basically for being shiny and resisting harsh physical conditions (such as humidity). The glory of Gold continues until this day where it is still considered an excellent commodity for achieving financial security. So, why to invest in Gold? Gold is a limited resource; this means supply is decreasing year after year while demand in the worst case scenario would remain the same, eventually the price would go up (Trend of average price in US$ is heading upwards over time). Great countries (such as China and India) did their math and they are also buying Gold in massive quantities. In my opinion buying Gold is somehow similar to land investments, however Gold is easier to maintain and take care of than land investments. Besides all of the above, one of the good reasons I am truly convinced with is that research says: Gold if obtained on a regular basis can beat inflation (inflation is the decrease in the value of money over time). Think of it this way, what was the price of a watermelon before 20 years and what is the price of a watermelon nowadays? Gold lasts, watermelon decays. The best method would be Gold coins. The two main forms of coins are "Rashady-which weighs 7 gm, pictured left" and "Englizi-which weighs 8 gm, pictured right". Both are 21 karat Gold. 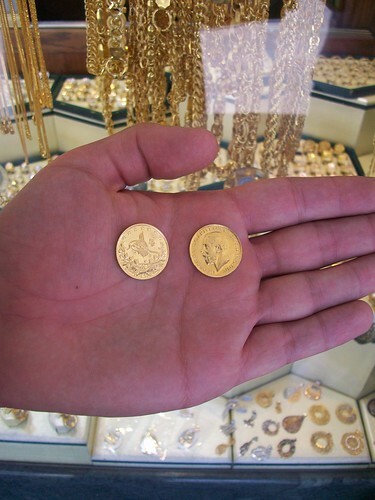 Coins are good because their sell/buy difference is small compared to jewelery. Or alternatively use this site Gold Price in JOD. I recommend you go to the Gold Souq in downtown Amman which might be a fun experience. Browse ten stores randomly and check for prices, this way nobody can cheat you. Also a sharp edge of the coin is considered a good sign. Get a receipt for your coin; this will help you in case you intend to sell it in the future. Every now and then keep track of Gold news, so that you will sell/buy at the proper time. I thought I should give priority to this post so that you can benefit from the current upward trend of Gold price (current price is $1090, analysts expect it to reach somewhere near $2000). Goldfingers are waiting for you, what are you waiting for ?! * Update - May 2010: Subscribe to this free newsletter which gives you hints about Gold price trends.